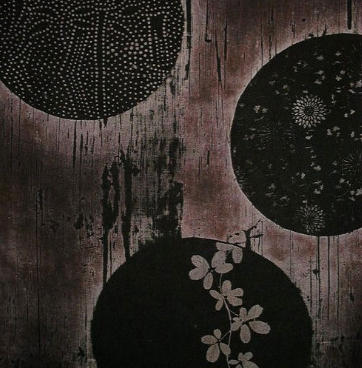 A potter and designer with a fascination for Japanese textiles. "Kimono fabric turned into fashion is my antidote to boredom, stodginess, blandness and the sameness of commercial attire. It also is my personal dream come true, and a guaranteed preventative, for a woman of a certain age, of becoming invisible!" Susan in the SuMoNo Designs textile studio. I spent most of my early life wearing uniforms of one sort or another - first Catholic school jumpers, beanies and clip on bow-tie with saddle shoes, and later the corporate “dress for success” outfit, of blue skirted suits, bow blouses, flesh colored stockings and sensible pumps. I found both stifling! I learned to sew as a youth, from my mother, who sewed from necessity, but the difficulty of finding inspiring fabric at the local stores left me frustrated. So, as a young adult I turned my hand to pottery instead. After several years of doing thrown functional pottery as a hobby, I discovered Raku firing. Raku is one of the lowest temperature firings, and features smoky finishes, crackled glazes and flashes of iridescence. 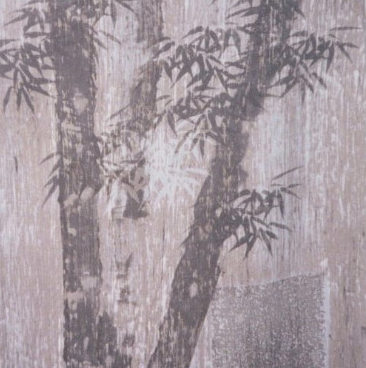 The finishes give a sense of antiquity, and people commented that my work looked "Japanese." So I started studying Japanese aesthetics and found it suited me. Fast forward to my retirement from corporate life and I wanted to resume sewing “fun” attire. 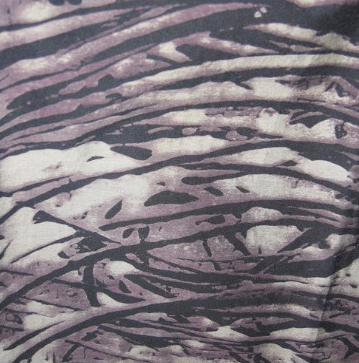 To complete my vision of what I wanted to make, I learned how to screen print with dye, and mastered many other techniques for patterning fabric used by the Japanese. 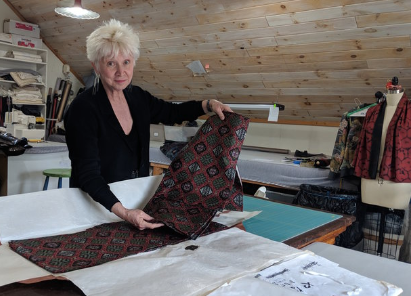 I sold my first hand-printed garments through a store on Madison Avenue in New York City and continued to make one-of-a-kind linen jackets for several years. Then I finally took my first trip to Japan! "The temple markets found me knee deep in silk and indigo hemp fabric. I WAS Smitten!" I discovered that kimono that cost thousands of dollars when originally purchased were being sold off at a fraction of their value. The Japanese don’t want to wear any one else’s clothes, no matter how immaculate, how fine, or well-preserved - perhaps because of their Shinto beliefs that objects have spirits? I began collecting kimono and bolts of fabric in earnest over 10 years ago - sending boxes home by mail almost daily while on trips to Japan and also wending my way from E-bay upstream into the Japanese language websites and becoming quite conversant in Japanese weaving and dying terminology. I now have a collection of over 1,000 fine quality, hand-picked kimono (full length) and haori (shorter jacket length) garments. The quality of the textiles in my collection is of the highest order, and represents a huge time investment in an exhaustive evaluation and selection process. 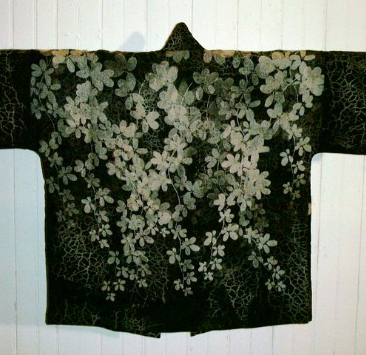 (In sharp contrast to the modern "bales" of inexpensive kimono that are commercially available.) I specialize in textiles that are casually elegant & lighthearted, that can be worn by women of all ages and are stunning, flattering and defy categorization. My garments are versatile and have been worn by business women, a well known Editor of a national magazine, at Carnegie Hall by the doyenne of a performing orchestra , and by fashionable women walking their dogs in my chic indigo hemp jackets that can go straight into the washing machine! My featherweight rainwear is ideal for travel and can be dressed up or down depending on the occasion. I conceived of the design before one of my spring trips to Japan and when people kept trying, literally, to buy the jacket off my back I decided to make more! My rainwear has has an easy-on/easy-off hood that eliminates the burden of an umbrella, roomy pockets that eliminate the need to carry a purse, and dolman sleeves that allow room for a sweater or hoodie on the coldest days, and also provide plenty of ventilation when the showers pass and the sun comes out! To make my rainwear the kimono fabric must be laminated…Sisyphus, the story goes, rolled the rock up the mountain, daily, and every morning it had rolled back down. It took me 4 years of intermittent efforts to locate a supply of laminate suitable for this project. No commercial laminator could handle it as Japanese fabric is too narrow for their machines, so I ended up establishing a laminating capability in my own studio and training people to conduct the careful, piece-by-piece, process. Me at the wood-fired kiln! I continue to create pottery , but have “graduated” from low-temperature Raku pottery, to wood-fired high temperature Anagama kiln firings - the highest temperature achieved in pottery firings (aside from spaceship nosecones, maybe). I now have my own Anagama kiln and a wonderful group of 8 people who gather and live here for ten days every summer to help fire the giant kiln. You can learn more about my wood-fired pottery at TheOkiDokiAnagama.com. I find the differences between both my art media inform one another and the Japanese aesthetic surfaces in notable ways throughout the body of my work.